Throughout world history, piracy has had a constant presence throughout certain parts of the world. Ancient piracy isn’t often discussed, but one could say that it was an incredible golden age because it was so common that it was often accepted as a simple fact of life in the Mediterranean. The mechanisms of ancient piracy and sailing were fairly simple. Trading vessels in the bronze age had very little supplies and were generally fully loaded and not very seaworthy. They stuck close to the coast at all times for these reasons, as well as to aid in navigation. Sea trading in any period of history has always been ridiculously profitable, even with the possibility of shipwrecks and piracy, so sea lanes were almost always busy. Pirates had a very easy time taking advantage of these ships as the pirate ships were much lighter and faster, loaded only with raiders ready for plunder. The raiders often hid in inlets or on islands along a route and sprung at a merchant ship before they could do anything about it. Though records are not very common in the Bronze Age, it seems that piracy was extremely common. Defense against pirates was difficult as the pirates almost always outnumbered their prey and retribution was difficult and expensive, requiring an often fruitless attempt by a military navy to find the pirates. Piracy was also seen as a semi-valid profession for those needing to make a living. Merchantmen down on their luck, or even ones suffering pirate attacks, often switched to a pirate life. Piracy may have grown so large that pirates amalgamated into the mysterious “Sea Peoples” who plagued the eastern Mediterranean late in the Bronze Age. The Sea People are still a heavily debated topic as we simply don’t know much about them. They could have been a nation of raiders similar to the much later Vikings. They also could have been a loose confederation of pirates. They do seem to come from the Aegean, an area full of bays, islands, and inlets that would foster a large pirate population. Whoever they were, the Sea Peoples tore through the eastern Mediterranean and actually took cities as far as Egypt. 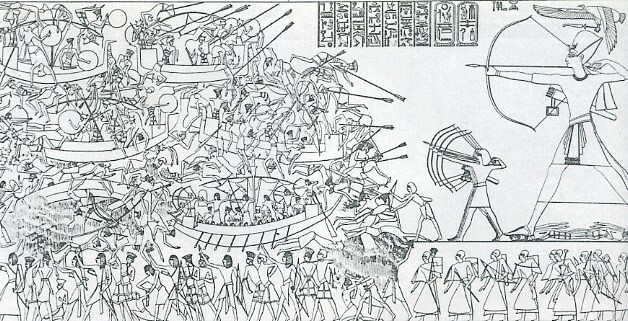 Ramses III suffered many Sea People raids before luring their fleet into the Nile Delta and ambushing them. The brutal battle and description of dragging the Sea People to shore and killing them would suggest that they could have been pirates, as no quarter seems to have been given, but we simply don’t know the details. Even in the rise of Greece and the Hellenistic Age, piracy still ran rampant through the Aegean. This led to some nations actually making a strong military effort to reduce piracy so that trade could flourish. The best example may be the golden age of Minos on the island of Crete. Again, this period is so early that we don’t know much about it. 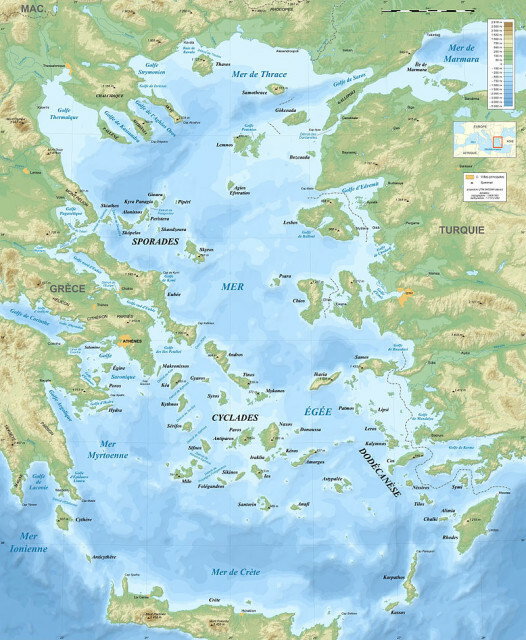 what we do know is that the island civilization flourished, with a powerful navy and economy, likely held up by substantial trading profits; at least until the massive volcanic eruption of the Thera volcano, now the island of Santorini, sent a tidal wave to crush the navy, harbor, and likely most of the farmland of Crete. Piracy was common during the rise of the Greek states, but at the height of Greek power, it died down a bit. This is because great trading civilizations such as Athens and Rhodes built up massive navies. These navies could patrol the local trade routes and just their presence kept a lot of piracy at bay. Alexander the Great was well known for conquering the Middle East, but he also took care of the piracy around southern Turkey and the eastern Mediterranean on his way. After his death, however, pirates took advantage of the massive warring successor states. In the early Roman period, piracy flowed furiously from the many hidden inlets of Illyria, modern Croatia. This is largely because the Illyrians, including their government, saw piracy as a legal profession. The kingdom of Illyria grew considerably in the 200’s BCE, occupying modern Croatia and parts of Bosnia and Herzegovina, Montenegro and Albania. Queen Teuta is often considered the “Pirate Queen” of antiquity, but they may be a bit misleading. Teuta was not a pirate herself, but an avid advocate of her nation’s right to piracy. In addition to piracy, Teuta’s navies were quite powerful and she extended Illyria’s power even more, stretching into the Ionian Sea. Some nations were outright incorporated into the Illyrian Empire, some were made into subject nations who had no say about the Illyrian pirates who had total freedom to raid their ships and shores. Two Roman ambassadors attempted to negotiate an end to Illyrian piracy, especially against Roman trade routes. Teuta refused and one of the two ambassadors was killed on the sail back to Italy, perhaps from a random pirate, or perhaps ordered by Teuta herself. With the death of an ambassador, the Romans quickly went to war against the Illyrians. Having fought through the epic naval war against Carthage, The Romans had a navy good enough to take on the Illyrians and the launched offensives into Illyria with great success. Teuta eventually had to send envoys to the Romans seeking peace just a few years into the war. By 228 BCE, the Romans had official control of coastal Illyria, all of the places where the pirates launched. This at least ended officially sanctioned piracy in the area, though the Illyrians would rise up again with more emphasis on piracy until the Romans finally established full control over the region. Teuta was one of the few truly powerful women in antiquity and she fought with all she could. Unfortunately for her, Rome was on their rapid rise and not even the Queen of Pirates could slow them down. The rise of Rome saw the steady decline of piracy in the Mediterranean. Many people are familiar with the story of Julius Caesar’s capture by pirates. Caesar was held for ransom, a very common pirate trade, while any poorer captives were simply sold into slavery. Caesar was uniquely carefree with his captors, going so far as to urge them to ask for more money. When Caesar’s ransom was paid and he was free, he immediately gathered several hundred legionaries to hunt down the pirates. He organized this so quickly that the pirates were still at the same hideout. Hundreds of pirates were killed or captured and Caesar had his captors crucified after retaking his ransom money. Because Rome still had scattered holdings by Pompey and Caesar’s time, pirates still had places to hide. Piracy grew again to the point where Pompey asked for special powers, including access to the treasury, thousands of men and hundreds of ships. In just three months, Pompey had all but eliminated piracy in the Roman-controlled Mediterranean. He achieved this through sheer military force; he killed thousands of pirates, and forced many more to surrender. The fear of death from Pompey’s pirate-hunting navy certainly loomed large, but so did Pompey’s favorable terms for surrendering pirates. Voluntary surrender meant that pirates were often given decent land to farm, providing a safe and stable life that was often difficult to find on the rocky shores where pirates often lived. The Roman Empire was an absolute blessing for peace in the Mediterranean. 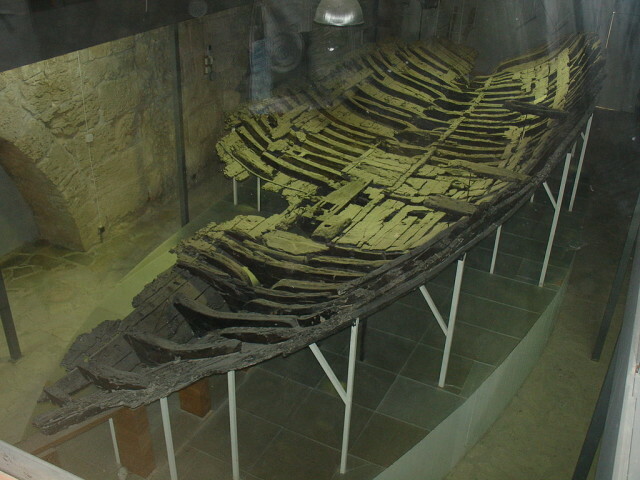 Piracy could still happen on smaller scales and was more or less allowed as the slave trade was seen as important to the economy. It’s no mistake that the Romans would call the Mediterranean Mare Nostrum, meaning “our sea”. Once the empire fell in the west, the Mediterranean returned again to widespread piracy for hundreds of years.